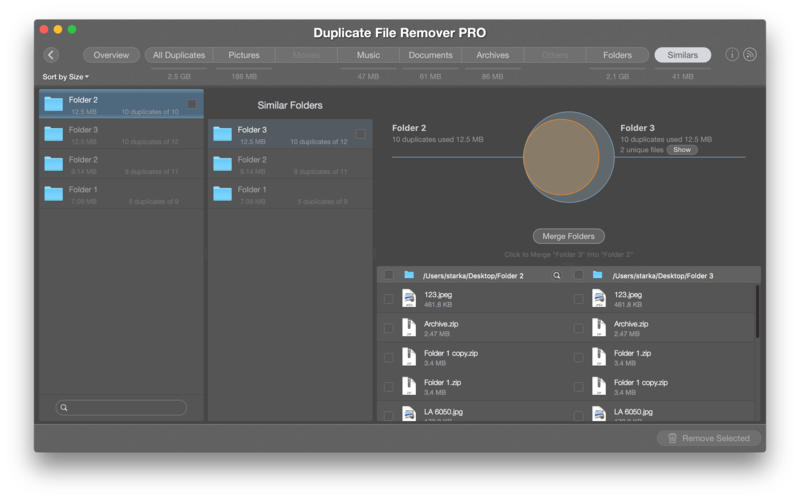 Besides finding and deleting dupe items on Mac, Duplicate File Remover Pro allows you to find similar folders and to merge folders by copying or moving the unique and duplicate files from one selected similar folder to another (similar folder). Please note, you can merge only folders that have some duplicate files and some unique files. Merging Similar folders is the best way to sort out folders that have a lot of duplicates but are not 100% equal. To merge Similar folders, launch the app, choose the folder in which to find duplicates, and scan for duplicates. When the scan is completed, switch to the Similars tab to preview the similar folders found. Here you can choose which folders to merge; select the folders and click the Merge Folders button. In the next dialog window, set up the options for the merging folders operation. You can choose either to copy or to move unique files, enabling the merger of duplicates with unique names, and removing the source folder after merging at the destination. 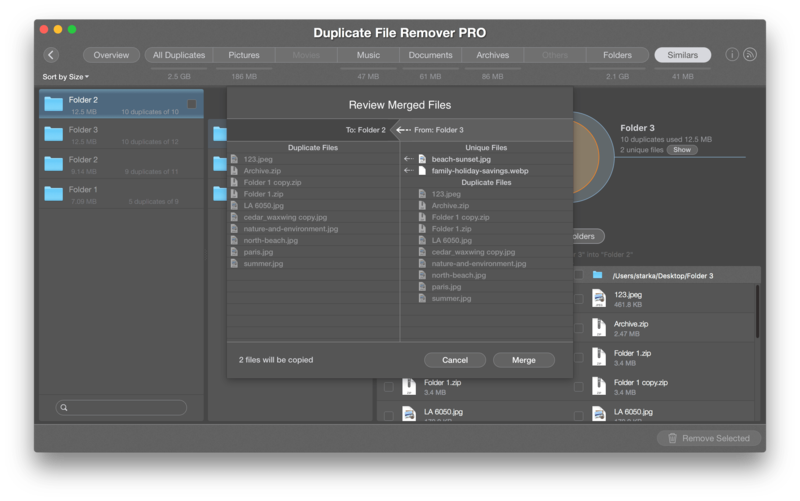 Note, it may happen that, when you click to merge folders, Duplicate File Remover Pro shows you a message about the impossibility of moving files and the requirement to confirm the operation in Finder. Why do you see this message? The destination folder does not have the Write permission or it is locked. The source folder does not have the Read permission or it is locked. If you want to continue and merge your Similar folders, click the Confirm button and enter your user account password. Duplicate File Remover Pro will then complete the task. The Merging Folders feature is of great benefit to users who want to organize their files. Merging multiple similar folders will make them identical so that you can just quickly remove extra duplicate folders without the necessity of navigating through dozens of duplicate files.